Called Kona Muffler and had my fingers crossed for good news about my car. The mechanic on the other end said ‘you have a major engine problem, there’s no compression.’ That’s mechanic-speak for ‘dude, your car is majorly screwed-up.’ They don’t want to touch it as they don’t do intensive, take the engine apart type of repairs. I don’t blame them, it’s a pain in the okole. So I have my boss help me tow my car to J.A.W.S. (Japanese Auto Works and Service) a shop specializing in Japanese cars. Okay, let me explain. My car is a Chevy Tracker but it’s pretty much a Suzuki Vitara built in Canada for Chevy USA. So they should be able to fix it huh? They quickly look at it and ask if it overheated, I told them the temp gauge never budged beyond normal temps, oil and fluids were checked in the past week and a tune-up performed in the past month. I’m going to have to wait until tomorrow for a diagnosis. So I leave the car there, once again crossing my fingers and hoping for the best. Assignments took me to a baby doctor’s office where immunizations shots were being given, it’s National Immunization Month and they needed art to go with a story. 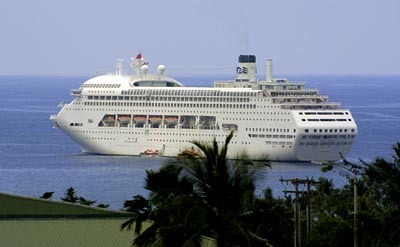 While waiting for the elevator on the third floor I got a view of this cruise ship sitting in Kailua Bay. A quick snapshot before my elevator arrived.